Ever think that you don’t have enough space to have a garden? Well, think again! You can grow delicious fresh tomatoes, cucumbers, herbs, and beautiful flowers. Best of all, you can do it in a small space! Make sure the location you choose will get plenty of sunlight during the day. There are many plants and vegetables that will do very well without sunlight, but the majority of them need a good couple of hours a day of direct sun. Without this main ingredient, your plants will not blossom and vegetables will not ripen. Keep a nice flow within your garden. For a good transition, you want to keep larger plants and vegetables in the back, smaller low-growing ones in the front. This adds depth to your garden and makes it appear much larger than it really is. Color scheme is important to keep in mind when planning your garden. For smaller spaces, you may prefer one color scheme. When you add too many elements of color, it can become overwhelming to the eye. Many of us today dont have the time or the space to grow large gardens. Why not try a smaller more specific garden. For example, try a Salsa garden. All you’ll need are tomatoes, peppers (red and/or green), and onions. What better way to create and maintain your mini garden, than with a mini tiller! The Mantis Tiller is perfect for maneuvering around those small spaces. Its small, powerful, and easy to handle. Its also perfect for creating and maintaining a raised bed garden, for flower gardening, and edging the garden. Go ahead, make the most of your space! 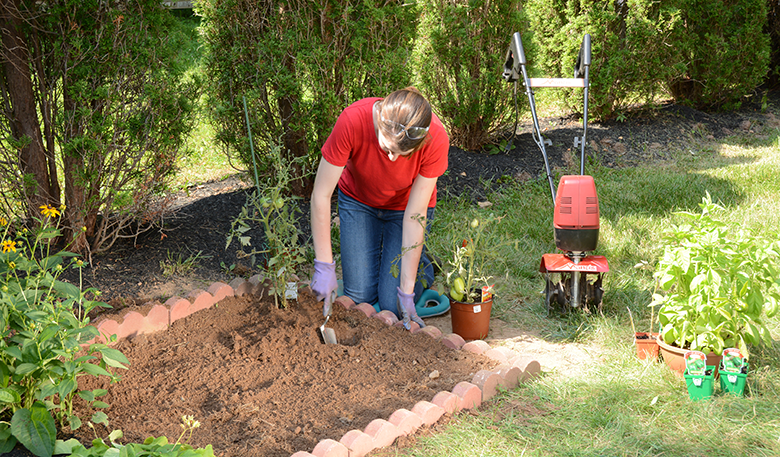 Let the Mantis Tiller help you create your garden today. I really enjoy your gardening tips that you started to put in the emails that you have been sending. Very satisfied with my Mantis tiller, compost bin, snow thrower(blower?) and the grass shears/hedge clippers. Keep up the good work. Stan, thanks for the lovely feedback! Thanks for reading! We couldn’t agree more! Simple is good. Want to buy snow blower similar to mine for two peoples who have been helping me with my garden and house. purchased a Mantis snowblower last year and think it is great. would like to buy two (2) more for gifts. Not listed on your Website. Please Help. thank you. Snow throwers not listed on your website. I would like to purchase two (2) more for gifts. Please advise.